Jazz jazz vocalist Christiana Drapkin celebrates the beauty and power of William Shakespeare's poetry and presents it in lively, sometimes haunting jazz arrangements. Christiana was inspired to develop this project after finding a 1964 recording by Cleo Laine, "Shakespeare and all that Jazz", on Fontana Records. John Dankworth had composed many of these arrangements for his wife; the rest were some light-hearted settings by composer Arthur Young. Quite unjustly, they seemed to have been forgotten and deserve to be heard again. The same holds true for a poignant setting of a sonnet by Duke Ellington and Billy Strayhorn, from the suite "Such Sweet Thunder". The Christiana Drapkin Jazz Group conducts both, concert performances for festivals and performance series, as well as high-school and college classroom workshops and concerts. The group's collaborative approach addresses the educational needs of the music, theater, and English literature curriculum in an enjoyable and dynamic way. The members of the group are graduates of music, drama, and history departments at Smith College, Boston University, and SUNY Empire State College respectively. As professional performers, they have also continued their education at other universities and in private studies with actively performing musicians and teachers. Vocalist Christiana Drapkin and her group celebrate the beauty and power of William Shakespeare's poetry and present it in lively, sometimes haunting jazz arrangements. 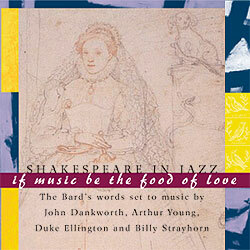 Christiana was inspired to develop this project after finding a 1964 recording by Cleo Laine, "Shakespeare and all that Jazz", on Fontana Records. John Dankworth had composed many of these arrangements for his wife; the rest were some light-hearted settings by composer Arthur Young. Quite unjustly, they seemed to have been forgotten and deserve to be heard again. The same holds true for a poignant setting of a sonnet by Duke Ellington and Billy Strayhorn, from the suite "Such Sweet Thunder". In concerts and workshops, the group intersperses the Shakespeare material with lighter but no lesser fare, standards from the Great American Songbook, which address the same age-old themes that were already sung about in the Bard's day. Christiana came to the US in 1980, as a German Fulbright exchange student in theater. At Tulane University in New Orleans, she discovered the inner workings of musical theater and, more importantly, the roots of Jazz. New York City has been Christiana's artistic home for the last 25 years. She now lives and performs in the DC area, branching out into educational live jazz programs for children with her "BOP GOES THE WEASEL - Jazz for Kids" program. She's discovered stellar players in the nation's capital and is delighted to partner with players like Paul Wingo, Mike Gellar, Steve Herberman, and Dave Mosick on guitar, Robert Redd and Don Buchanan on piano, and others. Christiana returns regularly for performances in the New York area. She also curates a Jazz Vocalist series at the Brooklyn Public Library, "Brooklyn Sings, Brooklyn Swings", now going into its sixth successful year. Through her continuing jazz studies with pianist Charles Sibirsky, she has developed a deep connection to the American standards and bebop repertoire. Combined with her voice training under vocal coach Barbara Feller, Christiana is known for her fearless and soaring improvisation lines, as well as for her highly personal delivery of lyrics. She has taken a lot of inspiration from workshops with well-known vocalists Tierney Sutton, Sheila Jordan, and Mark Murphy. Christiana has been performing in clubs and at festivals on the Eastern Seaboard for almost twenty years. She has released three CDs, "The Man I Love", "Songs About You", and most recently "Got The World On A String", which feature fresh takes on standards, from Porter and Gershwin to Parker and Monk, in addition to original compositions by some of her favorite fellow-musicians. Two years ago, Christiana presented this concert at the Kennedy Center Millenium Stage in Washington, DC. Since then, the group has played this unique program to delighted audiences in the Northeast. Michael Kanan is originally from Boston, MA, where he attended Boston College. His first Jazz instructor, Harvey Diamond, was a student of the legendary pianist and composer Lennie Tristano. After several years of study with Diamond and many freelance gigs in Boston, Michael moved to New York City in 1991. Immediately upon arriving, he studied for one year with another Tristano student, the great Sal Mosca. He continues his studies with Sophia Rosoff, who has been his teacher since 2000. From 1995 to 2001, Kanan was the accompanist for vocal great Jimmy Scott, with whom he toured the United States, Europe, and Japan, gave numerous TV and radio performances, and recorded three CDs. For the last four years, he has been pianist/arranger for the Jane Monheit band. With Monheit, he has toured the US, Europe, Japan, Brazil, and Canada, and has performed on her recent recordings. Besides his work accompanying vocalists, Michael has also played in several instrumental settings. He performed in New York with guitar wizard Kurt Rosenwinkel, and with him recorded the popular CD "Intuit" for Criss-Cross. Michael is a founding member of the International Hashva Orchestra, which also includes Mark Turner and Jorge Rossy. This group, which took a fresh look at the concepts of Tristano, toured Europe several times and recorded twice for the Swiss label TCB. Michael has also led his own trio, with bassist Ben Street and drummer Tim Pleasant on two recordings for Fresh Sound New Talent, "The Gentleman Is A Dope", and "Convergence". This year, Criss-Cross published his latest release with his longtime collaborator, saxophonist Nat Su from Zurich, "Dreams and Reflections". As the daughter of Las Vegas bassist, Kenny Greig, Stephanie grew up listening to live music, from the Musicians' Union rehearsal bands playing Count Basie and Duke Ellington charts to the eclectic mix of music that passed through the hotels on the Strip. At age fourteen, she was playing guitar in her father's pop quartet as well as in blues, funk and rock groups with her peers. As she grew, she developed a life-long love for the great Broadway composers and devoted herself to learning the American standard repertory. At Smith College, she focused on the intersection of music and theater, particularly the Brecht-Weill collaborations. After graduating, she spent a few years acting in small theaters in New York. In 1996, she acquired an upright bass and went to work. Since then, Stephanie has performed in Japan with her husband, pianist Michael Kanan, and has played all over the New York area. She is currently studying classical bass with David Grossman of the New York Philharmonic. Michael Petrosino, a native of Auburn, New York, now living in Brooklyn, began his professional career at eighteen, playing gigs in the Toledo, Ohio, and Detroit, Michigan metropolitan areas. He moved on to perform on cruise ships plying the world's oceans, backing such entertainers as The Fifth Dimension, Lou Rawls, Ben Vereen, The Temptations, and Gladys Knight. Returning to dry land, he landed in Cleveland, Ohio, where he played with local artists and touring artists such as Jeannie Bryson Rick Margitza, and Gerri Allen. Since moving to New York, Michael has become a fixture in the city's jazz clubs, including Visiones, Birdland, The Blue Note and others. He leads his own groups in New York clubs, featuring guest artists such as Bruce Barth, Xavier Davis, Joe Barbato, and Randy Johnson, to name a few.